Members of the Choice Roof Contractor Group install elastic coatings that dry to a clean, bright, durable finish that lengthens your commercial roof’s life by up to 36 years with just two applications. In the summer, they expand as necessary. During winter months, they go back to normal size. No leaks, cracks, or bubbles. There is a big demand for highly reflective elastic roofing solutions due to their cooling abilities and exceptional durability. The benefits are numerous and all building owners should consider elastomeric coatings before going through expensive roof replacement. Pressure washing with Rust Off ensures proper adhesion. Metal Encase Primer is applied over whole roof. All seams are taped with reinforced fabric. Base Coat is applied over all taped areas. All fasteners are caulked and protrusions reinforced. Final coat makes whole roof seamless & water-tight. Elastomeric cool roofs are formulated completely white to reflect heat and light from the sun. The federal government has created tax incentives for the elastomeric cool roofs members install because of their energy-saving benefits. Conklin’s total coverage solutions seal every seam and crack for a leak-free roof you can count on for years to come. The elastomeric roof coating systems our members use provide exceptional value and a long list of benefits that truly stand out. In the late 1970s, science and engineering came together to create a new choice for the commercial roofing industry. This new choice consisted of a roof coating that was elastic in nature. Elastomeric coatings were created, and they changed roofing history forever. One of the problems that the roofing industry faced was changing temperatures. Heat caused roofing materials to expand. This expansion would cause gaps in the roof. When the temperatures dropped, the opposite would happen. The roofing material would contract. This constant expanding and contracting caused excessive premature wear on traditional roof systems. The very nature of elastomeric coatings sought to change all of this. With an elastic-like material, there would be no problems. The Conklin elastomeric roof coatings members install expand and contract as needed. There are no bubbles, cracks or gaps in commercial roofs that utilize an elastomeric coating. Heat and cold are no longer a problem. 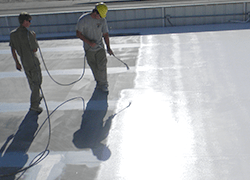 Elastomeric coatings also brought many other great contributions to the commercial roofing industry. The most popular was the energy savings. The white coatings created a “cool roof” system and helped to lower roofing temperatures by 30 degrees. This had a huge impact on energy savings. Buildings using the Conklin elastomeric roofing system saw huge drops in energy costs. These energy savings helped the roof pay for itself very quickly. In the past, a commercial roof would need to be replaced every 15-20 years. This was an expensive process that involved hours of labor and unneeded costs. The entire roof would be torn off and hauled away to some landfill. Seamless, elastomeric coatings can completely eliminate the need to replace a roof. One elastomeric roof coating can extend the life of a roof for decades, and a re-coat can easily extend the life even further. Roof replacement is no longer the best choice in many cases. Conklin is our preferred choice in elastomeric roofing. Their products have been put to the test for over 40 years, and they stand behind their products with solid, non-prorated guarantees. Don’t throw your money away with traditional roof replacements. Make the smart choice with a Conklin elastomeric roof coating. Give us a call today, and we’ll connect you to a member who will demonstrate the Conklin difference.